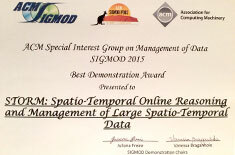 Robert Christensen and Feifei Li received the SIGMOD 2015 Best Demonstration Award for their paper and system demo "STORM: Spatio-Temporal Online Reasoning and Management of Large Spatio-Temporal Data”. SIGMOD is the top database and data management conference. Congratulations to Robert and Feifei and the other authors Ke Yi, Jun Tang and Natalee Villa.